With the monthly calendar, parents will receive registrations forms for upcoming optional activities. Each month, there are typically a choice of one or two activities. Each activity is usually 6 to 10 sessions (one class per week). 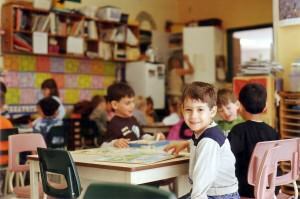 Children are divided into small groups according to their age for these classes. The additional cost for these activities goes towards paying the instructor and for the bus service when applicable. Activities take place at Montessori Pointe Claire unless otherwise specified. All instructors are certified for their classes and are fantastic at working with young children — we have chosen them with great care. Parents are always invited to watch their child’s final class of each session. Our experience with children’s Yoga is that the children just adore it! The children are taught fun Yoga poses as well as the discipline of focusing on their body and their breathing. Many of the Yoga routines and poses involve “animals” and “acting like animals” which makes it easy for the children to follow and enjoy. Children enjoy and benefit from age-appropriate ballet instruction. Ballet promotes physical strength and agility, can boost concentration, develops and understanding of music and rhythm, and generates a love of movement. Like all dance forms, ballet is physically intense. Ballet improves muscular strength, flexibility and range of motion, and cardiovascular stamina. Ballet training also boosts coordination and balance while correcting alignment. Like other forms of dance, ballet can improve body awareness and physical self-control. In addition to its physical benefits, ballet can also help improve children’s mental and emotional health. Training in classical ballet instills a sense of pride and accomplishment, which can boost self-esteem. As children improve and master more challenging movement combinations, they feel more self-assured, which can carry over into other areas of their lives. Dance training can also be a great way to relax and use excess energy productively. Sportball is one of our favourite programs. When the Sportball “coach” comes in with the equipment, the children are just delighted! Children learn the basis of eight sports (one per class): hockey, soccer, tennis, baseball, basketball, volleyball, golf, and football. The program reinforces the benefits of teamwork and skills development rather than the importance of winning, enabling children to gain the confidence and develop the social skills necessary to succeed in sport and life. Sportball is designed to teach kids the skills they need to get in the game including: balance, stamina, strength, timing, and coordination. Expert coaches break down the skills into kid-sized bites of fun in a supportive, non-competitive setting. Our amazing Karate teacher is Meghan Greig and she teacher a special form of Karate called Kodomo Karate. Kodomo Karate is a special class customized for the preschool aged population. This program is a unique blend of traditional martial arts etiquette and technique with age appropriate games and manipulatives designed to bring young children a love and appreciation for the world of martial arts. It’s so much fun as the children learn Karate through classes that go along with the school “theme of the week”. Each class begins with an activity called the “ski game”. “Ski” is the magic word in our karate classes. It means that students must stand absolutely still and quiet, waiting for the sensei to give instruction. In the “ski game”, students are asked to use them imagination to pretend to be something loud and fast. This might be their favourite animal or a gigantic T-Rex, or Lightning McQueen. All the while, students are listening for the word “Ski”. When they hear it, they race back to their spots, and stand at attention, completely silent. This is one example of the many activities and exercises designed to bring children from their natural state of high energy to one of of calm and focus. What is the end result? In each class the children will act out various scenarios according to the theme. The objective is to have the children learn acting skills while getting plenty of exercise and learning about the theme. The purpose of our theatre class is to inspire children to get up and move while they improve their locomotive skills, balance, co-ordination, creativity, memory, and team work. This program is excellent for all age groups including our youngest students! Skating lessons take place on Friday morning indoors at the Pointe Claire Bob Bernie Arena from January to March. THe program is given by certified Canskate instructors. Children do not require any previous skating program to participate in this program. The purpose of the skating sessions is to allow each child to improve his/her skating skills and have fun on the ice! The program includes a war, up to music, “Canskate” skating instruction, and playing games on the ice to keep children moving and having fun. Children are divided into groups by ability so children who already skate can continue with more advanced instruction. Lessons are for 10 weeks and at the end everyone is skating! The arena is heated to a comfortable temperature so children need only their snow pants, a sweater, skates, a helmet, and mittens. Welcome to a land of amazing adventure and thrills! Using your teamwork skills and imagination, your fantastic Facilitator will guide you and your team as you master awesome challenges. Make new friends, discover your own skills and collect some sweet treasure! Dynamic is an organization that specializes in team building and character development for kids. Their fun, hands-on approach motivates the children to learn important concepts such as respect, looking and listening, waiting their turn, how to work together, and being nice to others. The goal is to develop the skills required for leadership and sportsmanship. The workshops involve group work (the children are divided into small groups of about 6) to “build” or “create” by doing a fun activity with interesting objects such as building a skeleton with plastic “bones” using big plastic “pliers”. Dynamic teambuilding adventures teach kids to see themselves and every child as a valued team member. The goal for our Arts and Crafts program, which is given by a professional art teacher, is to have the children understand the importance and relevance of art as well as to encourage them to explore their own creativity. In a society where our children are so solicited and became passive in front of Medias like Internet, TV, and videogames… it is important to stimulate their creativity and show them a sense of completion the realization of artwork with their two hands can bring them. This also gives a boost their self-esteem. During the art classes, the children will learn different notions of art or history and at the same time learn that we can create artwork with all kinds of materials sometimes surprising ones. Art classes help to develop discipline and concentration. The hop is that children will develop a passion for art that will grow according to their personality. Daryl, our music teacher, has developed a fantastic program for our four and a half to five year olds that will allow them to start learning music theory. The xylophone (which is fun instrument for the children) is combined with music theory book that Daryl has written especially for us where the child will learn to identify the notes and play simple tunes. This is a great introduction to percussion and rhythm that allows the child to enjoy his/her first exposure to music theory while learning the basics that will be needed for any instruments in the future. The xylophone is usually the first instrument that a child explores. It helps children discover the magic of music and is a wonderful learning tool which combines many aspects of music fundamentals. We will learn about percussion instruments and the musical elements such as: melody, pitch, tone, dynamics, rhythm, and beat. We will use the xylophone as a teaching tool for note names and sounds, and our xylophone will accompany us as we enjoy singing and playing our songs. The Wimgym gymnastics program is very popular as it is a fun physical activity that helps the child develop his/her concentration, gross motor coordination and strength. The program is called “Kindergym” and is for children ages 3 to 5 years old. The classes start with a 10-minute aerobic warm up (movement and stretching to music). Children are then divided into groups of 4 to 6 per instructor and take turns using the various gymnastics equipment (beam, parallel bars, trampoline, foam pit, etc.). All equipment is very safe and the supervision and instruction is excellent. The instructors are trained gymnastics coaches. Each class is 45 minutes long and the program is ten weeks in total. Transportation to and from the gym is by school bus. Wimgym is located at 2100 Trans-Canada on the South Service Road just east of Sourced Blvd (in the same plaza as Ottimo Furniture). Swimming lessons are at the warm indoor pool at the Pointe Claire Aquatic Centre, corner of Douglas Shand and Maywood Roads. Lessons take place once a week from April to June. The children learn swimming techniques from certified instructors. Emphasis is on feeling comfortable in the water, learning to float, kick, and basic swimming strokes. The children have a half-hour lesson and afterwards play for approximately half an hour in the wading pool. Children are at all times supervised carefully by the teachers, the swimming instructors, and lifeguards. There’s a maximum of five children per instructor. This is a very enjoyable activity for young children and an important one as it’s a great life skill to know how to swim.